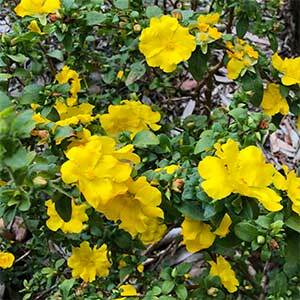 With attractive gold yellow flowers in spring, Hibbertia serrata is commonly called the serrated leaf Guinea flower. 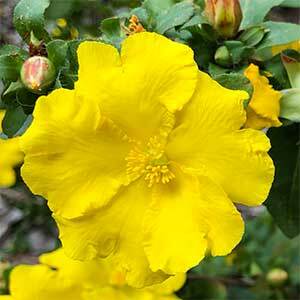 Originally from Western Australia it grows well in soils that are on the dry side and will flower in part shade. Masses of flowers cover the plant in spring, the named variety ‘Sun Shine’ is well suited\ to the vibrance of the bright flowers. The foliage has slight serrations on the leaf margins which gives it its name. Regular tip pruning after flowering will help keep the plant more compact and tidy. Spread – To around .4 metre. Coastal areas – Medium, third line.